The year begins with an unexpected connection to Eucalyptus and a deep need to follow this for a time, so I’ll return in April to evolve, to shed skin like the trees I’ve connected with, to create space and dream with the fire of the Portuguese sun, the eucalyptus trees and citrine stone. I do not know where this will lead but I read the words of Rumi: As you start to walk on the way, the way appears and know this to be the right approach. I will fly over alone, then backpack for a couple of weeks, letting the trees, stars and maps guide my feet. I will wild camp and hike, swim in the ocean and dream with the trees. 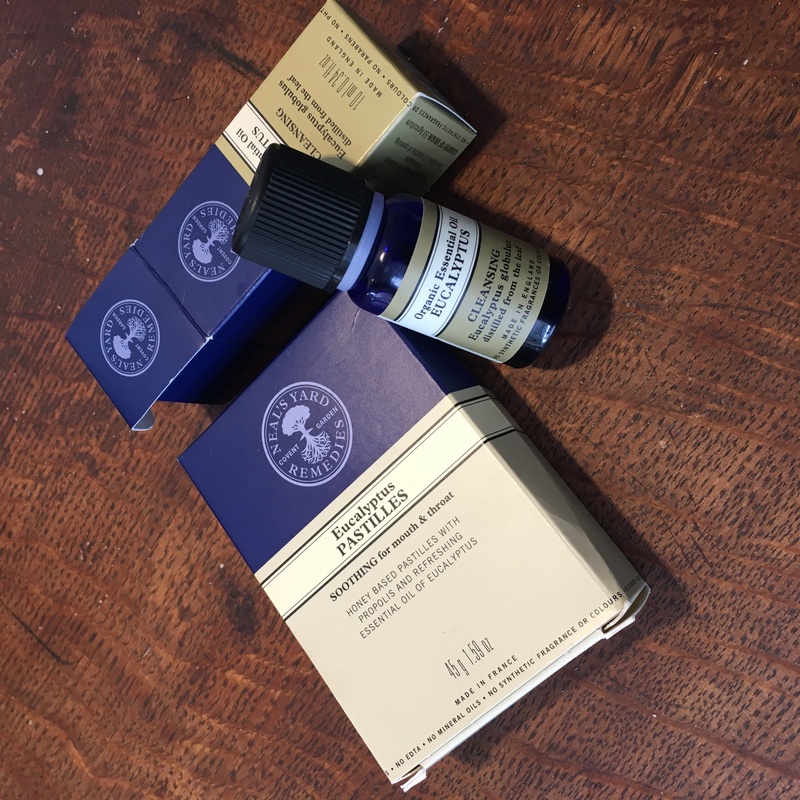 A good friend sent these Neal’s Yard goodies so that I can begin creating a strong connection with eucalyptus through the oil in nose and on skin, as well as pastilles in the stomach. Starting a new period of creative evolution has me thinking on a lot of things: I am mother, partner, daughter, step-mother, granddaughter and grandmother, (these last two seem impossible but the five of us span almost a century) and it has taken a long time to see past the guilt of needing more than this, of being more than this. I realise now that I am not solely these things, they are a deep and interconnected part of who I am, each one of these relationships is sacred, aiding growth and self-knowledge, and they will continue to do so, but I am my own woman, and also have to honour that or else I will desiccate inside (when I dream of water). I realise that I am not responsible for the weight of the world, it is time to put that burden aside. The only thing I can change is myself – so I will commit to that. Even when it means others being uncomfortable, because as we change, so our relationships change, some will become more solid, some will shake like autumn trees, but I have faith that we have rooted well. I take responsibility for who I am, I honour myself, my dreams are worth working for.